RG Club: Romance and Rhythms on Valentine's Day! - Yo! Venice! Home Abbot Kinney Blvd RG Club: Romance and Rhythms on Valentine’s Day! 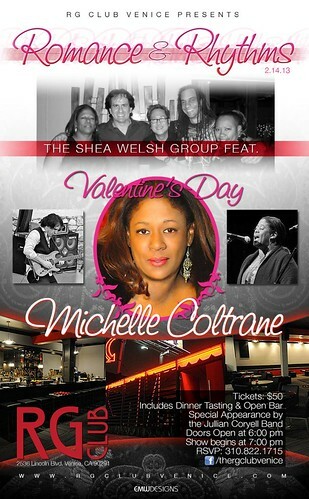 RG Club: Romance and Rhythms on Valentine’s Day! In search of a great Valentine’s Day date location? Dress up and head to the RG Club! The Shea Welsh Group will be playing with special guests Michelle Coltrane and the Julian Coryell Band! Tickets are $50 and include a dinner tasting menu and an open bar! The doors open at 6pm!